Today we were visited by Medwyn Williams. I asked Medwyn if I could put on my website that he was pleased with what he had seen. Medwyns answer was you can tell everyone that I would recommend Jamieson Brothers seed potatoes to anyone. I don't think recommendations can come any higher than that. This is great news that Mr Medwyn Williams is visitng us to view our huge range of potatoes. There will be more to follow on this top story. Jamieson Brothers are giving you the first chance of our limited stock of Maris Peer seed potatoes that will be available from July onwards. By simply going to our website now you can purchase 15 tubers of Maris Peer and 3 Grower bags for an amazing £14.99. I saw companies last year selling potatoes for £1 each so we are giving you the grower bags for FREE. We have put together 4 unique selections that are not for sale anywhere else online. In each kit you are supplied with 5 tubers of a first early, 5 tubers of a second early, 5 tubers of a late second early/early maincrop and 5 tubers of a late maincrop. Together with 4 of our JBA grower bags this is a complete season long system to provide you with a fresh source of potatoes for many months. This is an ideal selection of top quality potatoes for any gardener who want to grow potatoes in the comfort of their own back garden, balcony,patio or any other suitable place. Each bag can grow you between 9-12lbs(4-5kg) of fresh potatoes for you to amaze family and friends with their superior taste. Our Grower kit contains 4 JBA grower bags which are designed to make growing potatoes as easy as ABC. You also receive 5 tubers of Pentland Javelin which is one of the most popular potatoes in the UK. A tremendous flavoured potato when taken straight to the pot after harvest. 5 tubers of Charlotte which are best when used for salads and have an excellent waxy texture and refreshing flavour. 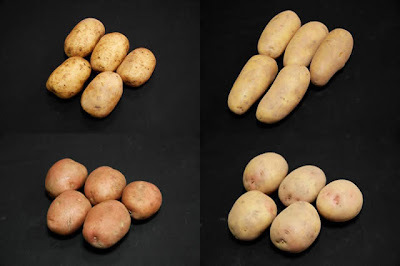 5 tubers of Romano which are one of the most versatile varieties available on the market today. This red skin variety is a great roaster and baking potato. 5 tubers of the ever popular King Edward. Rated as one of the best potatoes that has ever been bred, its presence in the kitchen for cooking ability and flavour is second to none. Now this exciting package would retail at £26 but we can pass on massive savings and offer you this complete growing kit for an amazing £13.95. That has got to be the best deal anywhere this year. Could It Be The Return of The 5 Packs? Our sales of 5 packs have forced me to buy a new specialist machine to cope with the demand. By next week I hope to have packs of 5 back on sale in the shop. Stay tuned for more important updates.